Calling all science teachers. I need some help. My Year 8s are currently learning about the particle model and states of matter. Like I mentioned in my previous post, many students have various misconceptions on the particle. They have already learnt about how movement of particles is related to the amount of energy they have, which then determines the state of the object. After they made their homemade thermometers and observed the liquid expanding and rising in hot water and the liquid contracting and falling in ice water, they wrote a paragraph using some sentence starters, that led them to use the particle model to explain their observations and explain how real thermometers work. Many of my Year 8s are actually thinking that the particles themselves become larger and smaller. They are confusing the particles and the matter made out of these particles. What can I do to challenge these misconceptions? I don’t want to just tell them to reword their explanation. I want to give them a learning experience that makes them realise their current understanding is wrong. 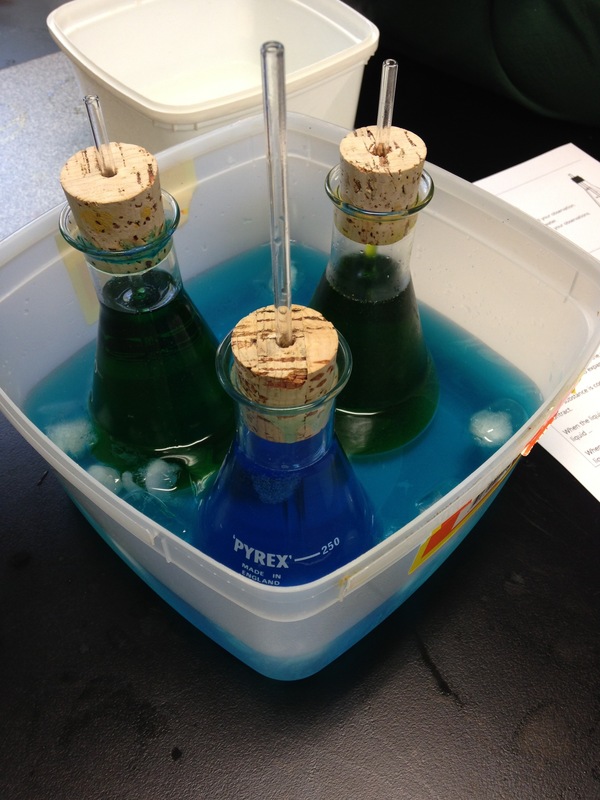 This entry was posted in learning, middle years, science by Alice Leung. Bookmark the permalink. I am not sure you can explain these misconceptions away. Your children are too young to understand change of momentum analysis of particle movement in gases or average position on expansion of a solid. What you can do is show the ball bearings bouncing in a tube being driven by a vibrating source. They then have an alternative to the particles expanding model they have developed. The concepts you are trying to develop are very difficult. You might just have to revert to assertion – scientists believe that etc. Thanks for your comment. They made popcorn in a beaker a few weeks ago to “see” that particles (popcorn kernels) gain more energy and move faster when they are heated. I try to make it a concrete experience for them as much as possible. Hi Alice, one thing I like to do is get about 10 students, and have 5 of them form a tight circle holding hands, with the 5 trapped inside. The circle needs to be close so as not to allow any room for movement from the other 5. I say that they all have very little energy and are lethargic and dont really want to move. Now what would happen if energy was put in to the system – you could tell them all to imagine they have had a can of redbull or something similar. What would they do then? Most likely want to move around and collide into each other and stretch the arms of the circle, making it expand! I do a similar thing with my students and it seems to make a lot of sense to them. They sit in tight rows of 4×4 and they are allowed to just jiggle a little in the same spot when they are solids, with more energy as liquids they can sway and begin to slide past each other and as gases they run around the room. Little bit chaotic in the end but gets the message across. That’s a great idea! I was thinking of getting them to role play it somehow. Came here to post the same thing as Anjali ! I describe it in terms of energy. Kids have lots of energy? They need lots of space.